The video was taken near the Simpang Empat exit on the highway, facing towards Ayer Keroh. "He didn't bother to move even after we honked at him," Rajendren, the driver of the car following the motorcyclist, was heard saying in the video. He had driven behind the motorcycle for five minutes. The video has garnered over 8,000 shares within two days. "There are rules for motorcyclists on the highway, the express lane is not for you to ride on with your legs flying in the air," Rajendren said in the video. He added that motorcyclists like the one in the video risk losing their lives if they were accidentally hit by lorries or other vehicles while performing such acts. "I don't understand why kids these days want to fly like that (on the motorcycle), what do you get from it?" Rajendren added. "Good job brother, I'd also get angry when I see kids acting brave (on the road)," one netizen wrote. "If you want to be a superman, go to the first lane. You're on the express lane. 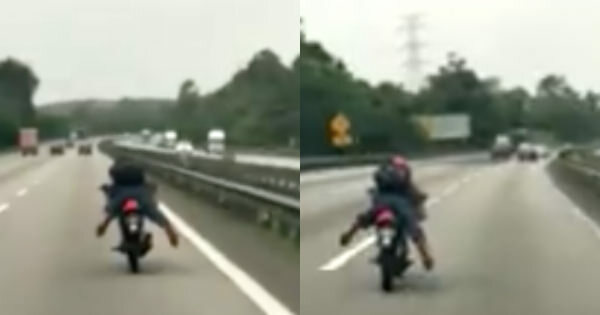 There's no point doing your stunt at cruising speed," another netizen wrote. One netizen criticised Rajendren for holding his phone while driving. "What was the speed of your car? (And) you were holding your phone while following the motorcycle," another netizen wrote. "The owner of the phone (which the video was taken with) doesn't have a driving license, (and) the original video is still on that phone," he wrote. He also explained that the video was taken from the backseat of his car. They were angry at him for trying to "cut" into their lane. The commuter rail system is going cashless.